Taking the lead in providing state-of-the-art solutions to problems of industries and communities, Mapúa University recently received recognition from the Department of Science and Technology for its research and development (R&D) undertaking. The Development of Wireless Sensory Network System for Structural Health Monitoring of Bridges (SmartBridge) Project bagged the 2018 Outstanding R&D Award for the Special Concerns Category given by the Philippine Council for Industry, Energy, and Emerging Technology Research and Development (PCIEERD) during its anniversary celebration last June 29. SmartBridge, a joint project between Mapúa and DOST-PCIEERD, advances the science of monitoring and evaluating the structural health of a bridge through vibration-based monitoring through micro-electro-mechanical system (MEMS). The great-value project accommodates the needs of different stakeholders such as the government and private sectors, civil and structural engineering industries, among others. The project, which started in 2014, is currently housed in the Yuchengco Innovation Center, the University’s research facility. “This is a great testimony that we can start small and win big. We just started the undertaking of high-impact and externally funded research around four years ago. Now, from literary zero, we have now an outstanding research project,” said Dr. Francis Adrine Uy, dean of Mapúa’s School of Civil, Environmental, and Geological Engineering and project leader of SmartBridge. The SmartBridge team members include Carluz Bautista, DOST-PCIEERD project manager, Roy Gallardo, Engr. Febus Reidj Cruz, Engr. Joy Carpio, Engr. John Mark Payawal, Engr. Jan Aldrich Gaviña, and Engr. Jesse Michael Baltazar. The team received P300,000 cash prize from PCIEERD. The award is given to recognize outstanding completed R&D projects in industry, energy, and emerging technology conducted in the Philippines by Filipino groups or individuals working in the industrial technology, energy, utilities, and systems, emerging technology, and special concerns sectors. Earlier this year, the Universal Structural Health Evaluation and Recording System (USHER), a by-product of the SmartBridge Project, earned valuable distinction from the UK Royal Academy of Engineering (RAEng). 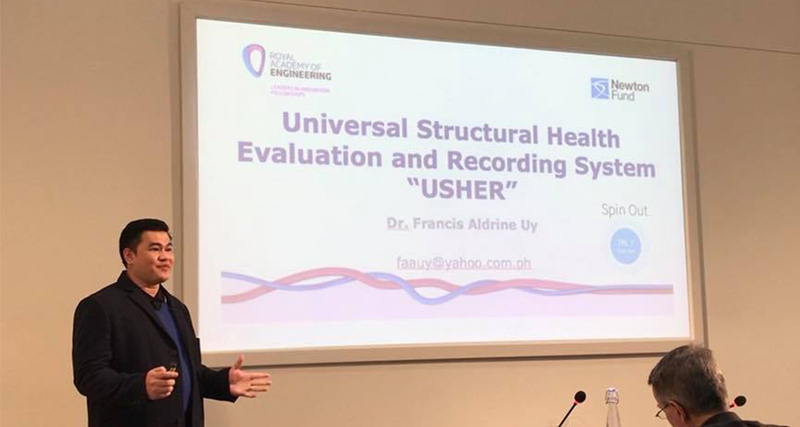 USHER, a building structure health monitoring system composed of an accelerograph or sensor and web portal system, emerged as the best project presentation in the Leaders in Innovation Fellowship (LIF) held last January in the United Kingdom. “It is a great honor not just for me but the entire Mapúa University. I am very happy because this will help us move forward with the first ever commercialization project of Mapúa. The training that we received through the fellowship deepen our understanding in business innovation,” Dr. Uy shared. Dr. Uy, along with other 14 Filipino innovators and technology-transfer officers, underwent an intensive two-week training course on innovation to build capacity for entrepreneurship and commercialization at RAEng. They also received further training from the Asian Institute of Management (AIM). LIF is aimed at researchers within partner countries who are in the process of developing a business proposition for their innovation. It is delivered as a part of the Newton Fund, also known in the Philippines as Newton Agham (Science) Programme, by RAEng, in partnership with DOST and AIM.